‘Big Data’ has been one of the buzzwords of 2014 so far. According to the researchers at St Andrews University, it’s the “storage and analysis of large and complex sets of data using a series of techniques including but not limited to machine learning”. Google has been one of the early adopters and now provides more information than ever to its advertisers via the Adwords interface. Fortunately it also provides access to automated programs, such as Adwords scripts to harness the real power of the available data. Quality Score: Boon or Bane? Google’s Quality Score metric has traditionally been fascinating and frustrating in equal measures. In theory a higher Quality Score can result in a lower cost per click and a higher ad position for the advertiser, however the lack of historical information makes it hard if not impossible to analyse QS over time. This Adwords script tracks keyword level QS over time, and you can schedule it to run as often as you may deem appropriate; hourly/daily/weekly/monthly etc. It also creates and logs changes in a Google spreadsheet, along with the option to send email notifications to the advertiser. In your Adwords account, go to the ‘Bulk operations’ section, click ‘Scripts’ and add a new script. Next copy and paste the piece of code (from the bottom of the page), choose a descriptive name and save it. Once authorised the script will automatically create a Google spreadsheet where historic QS changes will be logged. You can find the spreadsheet URL under the logs section after the script has been run once. A new label called ‘Track QS’ will be created along with 10 other labels (QS: 1 to QS: 10), these 10 labels can be ignored. You can apply the ‘Track QS’ label to the keywords you would like to track, and the script will track, log and email you the changes. 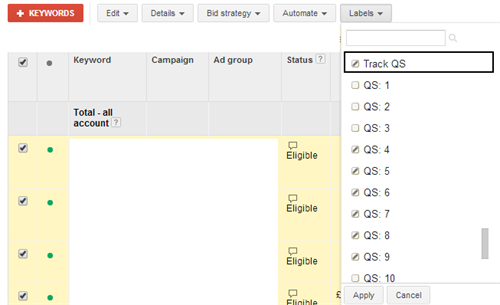 Simply changing the label ‘Track QS’ will also allow you to change the set of tracked keywords. 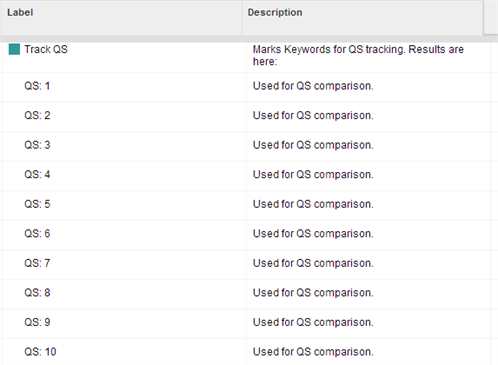 You now have detailed keyword level QS data at your fingertips. All that awaits is for you to analyse whether your ad copy or bid changes etc are resulting in QS improvements or not.